Kenneth Arnold Eckhoff was born to Arnold and Kate Eckhoff on January 3, 1923, in Moss Point, Mississippi. Eckhoff grew up in a small community within Moss Point known as Lily Orchard. The second of three children, Eckhoff had an older brother, Lawrence, and a younger sister, Mirle. His grandfather, Otto Eckhoff, raised him and Lawrence after their father died. Eckhoff’s hometown may have been small, but the area was very significant to the war effort. Ingalls Shipbuilding was located just one city over, in Pascagoula, and is still active today. Over 70 ships were built here during the war. Ingalls was one of the nation’s top industrial employers during the war years. The area was also used for military camps, such as the one set up along Pascagoula Beach from 1942 to 1943. In spite of the war effort the day to day lives of families like the Eckhoffs continued as they had been. The war did not make things easy for them, as money was tighter than ever, and it was hard to work the farms with just the women and children. The work of families like the Eckhoffs provided food to much of the area, while Ingalls Shipbuilding provided money for many of the people in the cities of the Gulf Coast region. 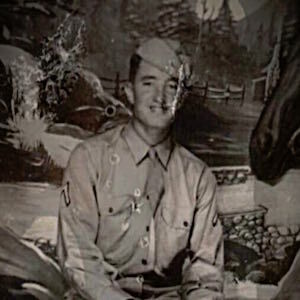 On March 10, 1943 Eckhoff enlisted at Camp Shelby, Mississippi, along with his brother, Lawrence and uncle, Stanley. He trained at Camp Sibert, Alabama and was assigned to the 113th Chemical Processing Company, in Camp Shanks, New York. The unit stayed there until it left from New York for Liverpool, England, for training and preparation for the D-Day landings. While in England, Eckhoff spent almost seven months rigorously training with his company and others as part of a chemical mortar crew. He rotated jobs; he either loaded and fired the weapon, served as a runner for ammunition, or worked as a radio operator. The unit transferred to Bristol, England and attended Bristol University multiple times a week for lectures in preparation for their mission. Several of the men in the company stayed with local families, making homes away from home. Luckily for Eckhoff and the other men, they were regularly shown movies and had holiday parties in Bristol. After the initial landings, Company C moved on in support of the 8th Infantry Regiment. They followed them along major routes through Normandy to liberate the region, which led them to Sainte-Mère-Église on June 7, and through Fresville on June 8. They would come within 1.5 miles southwest of Montebourg on June 10. On June 11, Company C was detached from the 8th Infantry Regiment and sent to help the 101st Airborne Division. On June 12, Company C was attached to the 22nd Infantry Regiment. They supported this regiment until June 17, when the entire battalion, except Company B, was attached to help the 39th Infantry Regiment. On June 18, Company C was reattached to the 8th Infantry Regiment. On June 19, after some harassing fire on German positions near Montebourg, an explosion hit the 2nd platoon, killing a dozen men and wounding twice as many. 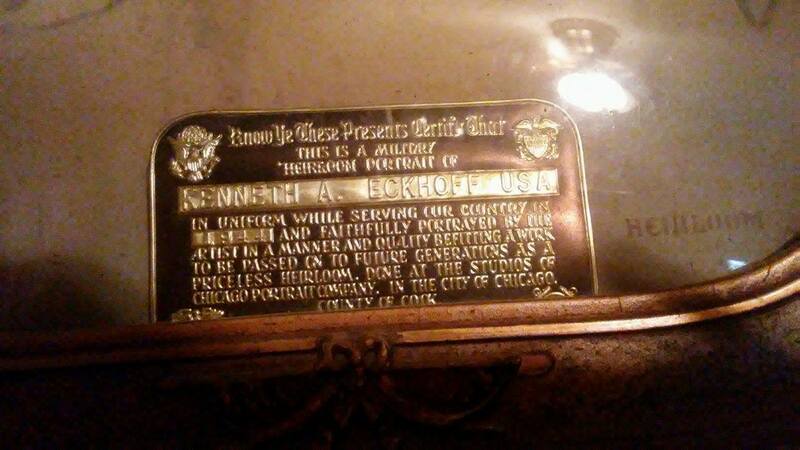 Private First Class Eckhoff was one of those killed. He was originally listed as Missing in Action. Kenneth Arnold Eckhoff grew up like many other young southern boys, on the family farm. He was a hard working young man by all accounts, and even dropped out of high school after two years to help work on the farm. He worked hard after his father, Arnold, died, along with his older brother, Lawrence, and his grandfather, Otto, to keep the family’s farm running. The war would prove to be a problem for Eckhoff, as with other young men. 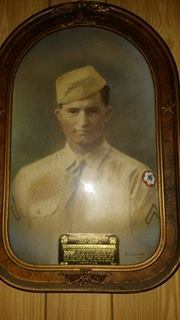 In 1943, Kenneth, Lawrence, and their Uncle Stanley all joined the United States Army to serve and defend their country. While in the Army, Eckhoff never really made much of a name for himself. His performance was not noteworthy, but nonetheless he fulfilled his role as was expected of him. Sadly, Eckhoff’s story is different from other young men’s, even from that of his own brother and uncle. On June 19, 1944, Company C of the 113th Chemical Processing Company, 87th Chemical Mortar Battalion took positions on a hill just west of Montebourg, France. After firing between 400-500 rounds of interdictory fire, at around 1:00 p.m., a massive explosion rang out as second platoon was displacing forwards, the cause of which is still unknown, killing 12 and wounding 24. Private First Class Kenneth Eckhoff was among the 12 who were killed. While I still truly love and always have loved to study World War II, this trip provided me with knowledge I had never dreamed of knowing. Coming from a military and police family, sacrifice is not always hard for me to understand, but it is easy to overlook at times from a historical standpoint. It is important that I share what this trip taught me: that is to always remember that no one is just a number. Everyone was someone or something to somebody. If we do not take the time to study these heroes, they may well be lost in time and become a statistic, and that is not fair to them. I also found a new passion to really dig deeper. It is easy to get discouraged when things do not come up, and believe me when I say that is pretty common. It is important to never give up. If you do, then who will tell their stories? After getting home from the trip, I felt as if I was not done yet. It is my job to tell my Silent Hero’s story. Today, we must thank all of our service members for the parts they have played in preserving our freedom. We must also remember that each and every soldier, sailor, airman, Coast Guardsman, and Marine who gave the ultimate sacrifice does not truly die until they are forgotten. They are not numbers, they are not just another statistic, and through this project, it is the hope of his family and friends to make sure that Private First Class Eckhoff does not become one either. He was a brother, a son, a friend, a neighbor. He was a person and a hero. He is my Silent Hero. Eckhoff Family Photographs and Painting. Courtesy of Marie White. Mississippi. Jackson County. 1940 U.S. Federal Census. Digital Images. http://ancestry.com. World War II Operations Reports, 1941-48, Records of the Adjutant General’s Office, 1917-, Record Group 407 (Box 14998); National Archives at College Park, College Park, MD. Brophy, Leo P. and George J. B. Fisher. The Chemical Warfare Service: Organizing for War. Washington, D.C.: U.S. Army Center of Military History, 1989. http://www.history.army.mil/html/books/010/10-1/CMH_Pub_10-1.pdf. “Kenneth A. Eckhoff.” American Battle Monuments Commission. Accessed February 1, 2017. https://abmc.gov/node/408309#.Wacn3ciGPIU. “Hermina Strmiska, welder: ‘I guess they needed us, so they put up with us.’ The Oregon History Project, Oregon Historical Society. Last updated 2017. Accessed August 30, 2017. https://oregonhistoryproject.org/hermina-strmiska/. Kleber, Brooks E. and Dale Birdsell. The Chemical Warfare Service: Chemicals in Combat. Washington, D.C.: U.S. Army Center of Military History, 1990. http://www.history.army.mil/html/books/010/10-3/CMH_Pub_10-3.pdf. “L. N. Dantzler Lumber Company.” Mississippi Rails. Last updated 2014. Accessed August 30, 2016. http://www.msrailroads.com/Dantzler.htm. Records for Kenneth A. Eckhoff; World War II Army Enlistment Records, 1938-1946 [Electronic File], Record Group 64; National Archives at College Park, College Park, MD [retrieved from the Access to Archival Databases at http://aad.archives.gov/aad/fielded-search.jsp?dt=466, February 19, 2017]. “Unit History of the 87th Chemical Mortar Battalion, 22 May 1943 to 6 November 1945.” U.S. Army Chemical Weapons Battalions. Accessed August 30, 2017. http://www.4point2.org/hist-87.htm#0644.